Last week we organized and culled our recipes and marked or looked through our recipe books. Remember that we're working this month to have a fully planned menu for May. Now this week we get to have fun! The first thing we're going to do is make our recipes quick and easy to access. DIGITAL PEOPLE: If you keep most of your recipes online or digitally or use them directly from the internet, or pinterest, create an easy access list in a word processing document with clickable links. 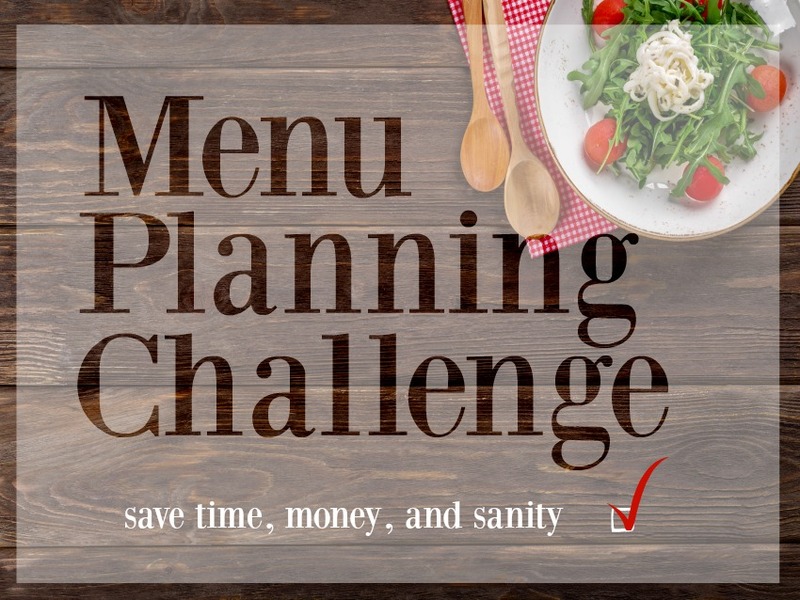 Or create a pinterest board or boards (main dishes, main cooking method, desserts, etc). I highly recommend you make a board titled something like "recipes to try" and then one for recipes you've already tried and know you like and would repeat. This way you won't clutter up your boards with recipes that flopped or you just wouldn't make again. ANALOG PEOPLE: Since you've culled your recipes, find a way to organize them. I use a big very heavy duty binder, exactly like this one. It's a bit pricer than the usual binders, but I've had so many fall apart and was tired of replacing them. This one has held up beautifully! I use page protectors (because I'm a messy cook) and put them in the binder according to main protein (chicken recipes, beef, meatless, pork, soup, etc). Then I place together the recipes for side dishes, desserts, and homemade sauces, etc. Create daily themes to make the planning super quick and easy. For example, I know that on Thursdays I'm out of the house most of the day, so that's my crockpot day. Saturdays are the days I'm in the house more, so I do some meal pre-prep for the week and double what we're having for dinner that night and freeze one (so it has to be a freezer friendly meal) so this is our Make One, Freeze One day. Also, if you're going to eat out, plan it ahead and write it in so you can be intentional. So much of our budget is blown on unplanned trips through fast food or pizza because I didn't plan or am missing an ingredient. But, if you have the budget, be sure to plan your nights out! Make lists of your recipes (just the titles) according to the themes you have picked. If you are going digital, make a list with a clickable link and save it on your computer for fast and easy access to your recipes. I have lists on notebook paper in the front of my recipe binder for each theme of the week. For example, I have a list of all my chicken recipes and all my beef recipes, etc. Then lists for specific themes, even if they are listed under the general heading of chicken, beef, etc. I want to be able to turn to a page for a specific situation and go from there, rather than go through all the beef recipes and wonder have to remember which ones are crock pot, which double well for a crowd, etc. If you want more help on planning your daily themes, ideas for what other people are doing, or a community to learn from, it's all happening over on the Facebook Journal and Doodle page right here. This week we'll be sharing tried and true recipes for theme nights and pics of what we're doing! There are some really great ideas over there already and I hope you'll join us!